IT executives often get excited when they hear about offshoring, i.e. outsourcing to foreign countries. They are of the view that due to lowered wages for software developers in foreign countries such as India, they’ll be saving up a lot of money by offshoring. Therefore, they look for the cheapest rates and in the end act surprised when the outcome is not as expected. Then they end up blaming offshoring as a whole. Regarding the costs related to domestic outsourcing, it is evident that it will be higher if the wages of software developers in your country are greater than in other countries. So, what are the cost estimates and where will you be spending the most of your company’s money? Taking a step back, you should know that the overall objective is to attain a great software, not to compete to bring in the cheapest deals. Apart from the basic work process costs, there are a lot of hidden costs associated with outsourcing that executives tend to overlook. This can be the cost of management of the outsourced team, unplanned logistic activities, etc. 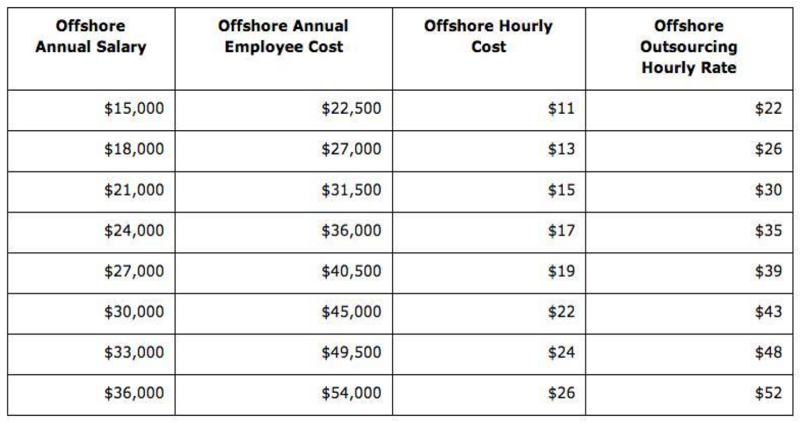 Let’s look at the costs associated with offshore outsourcing. Now, let’s take a look at the costs associated with domestic outsourcing in the US. It is evident from the above table that the costs associated with domestic outsourcing in the US are much higher as opposed to the data shown by the offshore rate table. Even within the U.S., salaries tend to vary a lot. Generally, New York is way more expensive than Kansas City, which is even more expensive than the rural states such as Maine and the Dakotas. Why Would Anyone Go for Domestic Outsourcing When It Costs More? The question now is, why would you consider domestic outsourcing when offshoring is clearly budget-friendly. This is due to some reasons. The most significant one is the ease of collaboration. Yes, the thing about domestic outsourcing is that there are rarely any cultural differences and, as such, no language barriers. This makes collaborative work much more efficient. As you are already aware, it costs a lot more for an employee’s compensation than it does for merely his/her salary. A reasonable estimate for healthcare, taxes, retirement plans and vacation time is about 33%. That means the salary is roughly two-thirds of the total compensation for an employee hired to do software development. While it is certainly not encouraged that you make cost your priority while looking for software developers, it is possible to find skilled professionals at $30 per hour. Even if you go for $35 per hour, it is still a pretty neat deal. The trick is, you just have to know exactly where to look. It is typical of outsourced software developers to supervise all the customary software development tasks. So, the question arises: If a company opts for hiring an outsourced software development team for handling the same tasks as an in-house team would, isn’t it somewhat foolish to suddenly start prioritizing cost over quality? Think about that for a moment before potentially jeopardizing the quality of your company’s work by settling for lower costs.